You will be pleased to hear that Allen Burrell finished 3rd out of a fleet of 51 in the French Championnat Senior, ( Like an RYA national title) with John Heyes 7th… despite a bit of dodgey French cheating. Allen was there as a warm up for the World Masters Championship at the same venue next week, with 280 boats entered, so we will try and keep you posted. Some of you won’t know me and others might think I’ve left the club. someone please help and swap duties with me? Sea Safe 3 on Saturday 20th June. can do either of the dates above, please call me on 07867 518046. Catering facilities and the bar are open to all – please join in and add to the party atmosphere. All help and offers of assistance to provide full safety cover and aid launch and recovery of boats will be very appreciated (the urn will be on the bosuns hut so help yourself to a cup of tea/coffe or to keep you going). Sunday 24th May – Basket meals avail 7-9pm – Fancy dress competition – theme is linked to boat names or design names listings avail http://www.national12.org/boats/index.php. Good luck to all sailors and hope you have lots of fun and most of all we have favourable weather. This Tuesday (19th May) is the first of the Evening Points series, what a great way to relax after a day at work. Come down and enjoy the light evenings on the water. Please note ALL the midweek races start at 19:00 and are mass starts. There are some notably good shots of a moth, skiff, and 49’er on saturdays race, and some of the sandhoppers on sunday. Credit to the photographers, Neil Hurrell on Saturday and Rebecca Gruncell on Sunday. and at some point during the exercise our boom simply disappeared. We may have left it on the grass while rigging and left it behind when we crossed the road and hope that some well intentioned individual found it and put it somewhere for safe keeping. Any information leading to recovery would be much appreciated. We are talking about a 2.5m length of black anodised tube approx 60mm in diameter. Congratulations to Martin and Nick Binnendijk for winning the Yantlet race yesterday out of 50 entrants. 15 Sandhoppers were in the top 20 places and with 17 sandhoppers starting they were the largest class on the water, top marks to Peter and John in Talitrus along with John and Janet in sandpiper who showed the rest of the fleet their skills with tide flow across the thames. As for chris and toby in Nemises (DBL) along with Apollo and Sand star… boys need to take note of tide times and race course instructions!!! A fantastic race was had by all in glorious conditions. Fancy something a little special to eat? Jo has produced a very special menu for Friday 15th May – some 25 bookings have already been made. Give Jo a call on 07500 878 249 if you would like to join in. DESSERTS AVAILABLE ON THE EVENING. LIMITED NUMBERS OF EACH DISH AVAILABLE, SO PLEASE PRE-ORDER TO ENSURE YOU GET YOUR FAROURITE! Rules: What’s new for 2009? 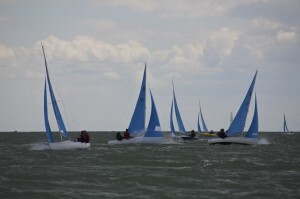 Useful Powerpoint (.ppt file) from the RYA here: Racing Rules of Sailing 2009 – 2012 What’s new?